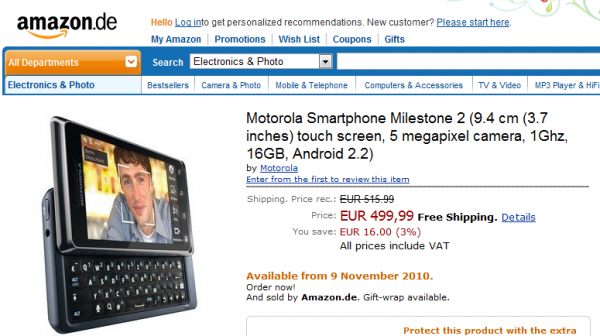 To all of our Euro readers who were patiently awaiting the arrival of the Motorola Milestone 2, the time has come. If you buy one today for 499 Euros through Amazon Germany, your device will ship by November 9th, or least become available then. Talk of the Milestone 2 front had become pretty quiet after its quick appearance on Youtube back in August, so it’s nice to see it re-emerge. For those new to the device, just think of it as the Droid 2 only it shoots HD video and has a slightly different look to its Blur skin. Everything else is exactly the same aside from the missing “DROID” tag. To our friends around the world, you grabbing one? DROID Incredible OTA Update Available via ROM, VCAST App Store Included?